Finland: Public and Community Health nursing in Savonlinna and outlying communities, community hospital and clinic tours as well as interaction with Finnish Nursing Students. 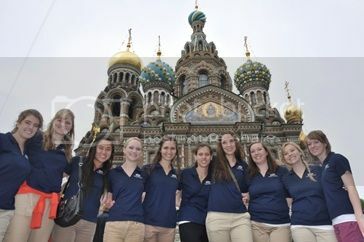 Russia: The Harbor (orphans), St. Petersburg Nursing School #1, Hospital tours; Skyping interchange with Nursing Students in Russia prior to visit. Day trip to Tallin, Estonia, and Stockholm, Sweden, seeing the sites in Helsinki and St. Petersburg. The Russian ballet at the Hermitage is always a must! Staying with in the historic 100 year old, Sinnetalo "The Blue House" with Finnish physician, Leena Kosmo; Ovalinna Castle, forest walks, Karelian dancing, cooking, Easter traditions, local plays, swimming, sauna, opera dress-up, Ladies of the Castle Walk/Run, and cycling the countryside. Approximately $4500 high end (including tuition) - includes ALL expenses: Russian visas, air flight, trains, local transportation, hostels, admission fees, Russian ballet, ferries, translators, all food and even bathroom money.